← Is Tropical Storm Bertha heading for the UK? Tropical Storm Bertha is currently off the north east coast of the US and is likely to become an ‘extra tropical storm’ on Thursday. It’s then expected to track across the Atlantic – and while there are still a number of possible outcomes, it looks increasingly likely that the UK will miss any serious impacts from ‘ex Bertha’. The Met Office has been assessing the likelihood of the UK seeing any effects from Bertha by using our own forecast model alongside models from other world-leading forecast centres. 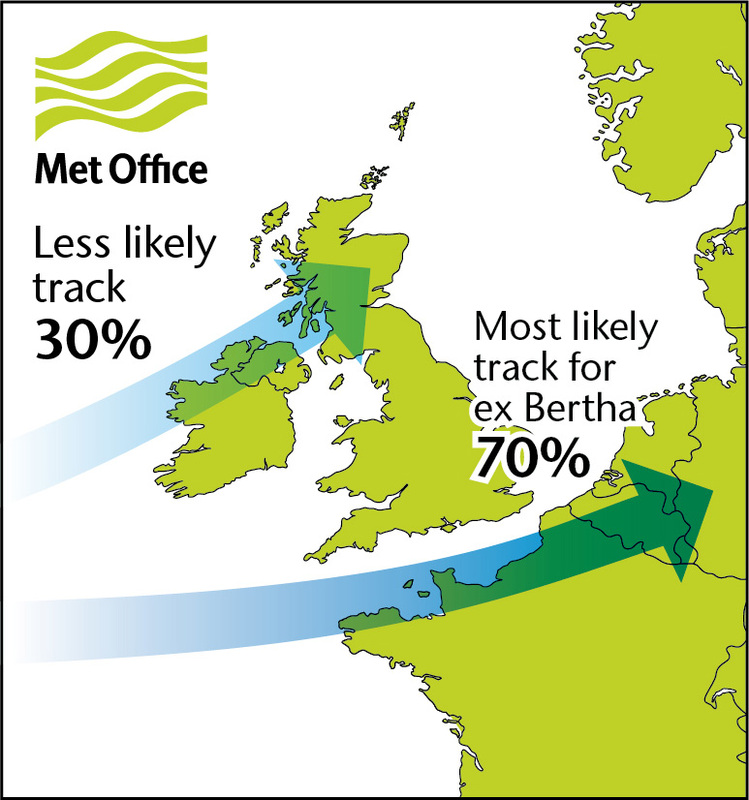 Map shows likely storm track for ex Bertha by midday Sunday. At the moment the majority of forecasts from those models suggest ex Bertha will track to the south of the UK as a relatively weak low pressure system. In fact it’s debatable whether this is even ex Bertha, as the storm declines to such an extent as it comes across the Atlantic that it fragments. Some of the warm air which it drags across then leads to a new weak low which generates an area of heavy rain. This could move across northern France and possibly clip eastern parts of the UK on Sunday. A much smaller number of model outcomes suggest ex Bertha will move across the UK as a more distinct feature which could bring some strong winds and heavy rain. Because these outcomes are in a minority, however, they are less likely. While there remains a good deal of uncertainty about the weather on Sunday, it currently looks as if it will be fairly unsettled with some rain and breezy conditions – but nothing too unusual for the time of year. It’s worth noting that it’s likely that the south east of England will see some heavy rain on Friday, which is not part of Bertha. You can see more about this on the Met Office’s severe weather warnings page. We’ll be keeping an eye on the latest outlook for the weather over the next few days and the progress of ex Bertha to keep everyone up to date with the latest information. This entry was posted in Met Office News and tagged bertha, gale, hurricane, Met Office, rain, Storm, summer, tropical storm, UK, wind. Bookmark the permalink. Nothing like nailing your colours to the mast! Only time will tell I suppose. And as you say the possibility of this happening on Sunday is eclipsing what may be a more severe weather event on Friday in the SE of England. Watching the forecast on BBC TV at 1.30 pm does show a shallow low moving into N France on Sunday, but contrary to what you state “This could move across northern France and possibly clip eastern parts of the UK on Sunday” the graphics show heavy rain moving into the SW and then extending along the south coast of England, before making way for heavy showers across the whole area during the afternoon. Perhaps they are using a old or different model run though…. Erm, but when did unsettled, rainy and breezy become normal for Summer? Is our climate that changed that we just accept that this is as good as it gets now? To @ThePhillow it’s perfectly normal to have weather like what we expect from Ex-Bertha during summer, August especially. Unsettled, rainy and breezy is often a common feature of the UK summer – it’s just that the summers of the 90s and 00s were often much drier and warmer than normal (rather like June and July 2014, of course) so people nowadays expect too much. Otherwise it has been a very good summer.